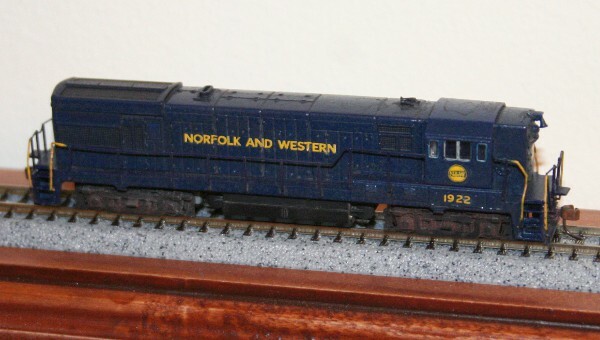 I model the Norfolk & Western in 1971 (in addition to my fictional WP&P, which I treat as if it were recently merged into N&W). I’ve got a good sampling of EMD and ALCo engines to fill my roster, but one thing lacking are the GE U-boats. I can readily get my hands on a U25b, but the N&W had only a few of those, via mergers. In 1971, what they really had a lot of were U28b’s and U30b’s, neither of which has ever been offered in N (much less with a high nose). However, Minitrix did offer a U28c, and that started giving me some ideas. I own a really old U25b in Wabash paint, and its frame and wheelbase would be right for a U28b. I also happen to have a B23-7 that I picked up mainly due to its high nose, although it represents a unit that would only have existed much later in the 1970’s. Finally, I have an unused Trix shell (I experimented with using the chassis for some other project). It seems to me that some form of kitbash using elements from all three can actually get me to a single high-nose U28b. One of the first things I noticed when I got the shells off, other than that all the shells do indeed fit over the mechanism (I’ve run into the issue before where this wasn’t the case), is that the two chassis are different in one critical regard. The older U25b (I wrote on it in Sharpie to make sure I don’t get them mixed up) has a ledge cast into the metal that fits under the walkways, whereas the newer B23-7 lacks this. Since I’m trying to situate the new walkway over the old chassis, this meant that I had to do some carving. I know it’s hard to see since it’s all black, but there is a flange on the interior side of the walkway that has to get carved off so that the walkway can sit down flat on the metal chassis. In this photo, I’ve begun to carve away the flange on the back side, while the flange on the front side is still there. I just used my X-acto knife as this doesn’t have to look terrific, it won’t be visible. I also swapped out cabs, which is easy since both models use the same separate cab design. The blue cab fits right into the notches on the hood, although it has to have the front windshield and number boards cut away so that it can slide down all the way. After I got the walkway fitted and the cab modified, I was able to piece things together, and when I did I discovered that the blue cab is not quite as tall as the one it replaces, so I had to add about 0.040″ of styrene to the bottom. I stripped the paint using an overnight soak in Pine Sol (except for the cab, since it’s going to get painted Pevler Blue eventually anyhoo), and I plugged the various gaps in the Trix long hood shell using small rectangles of styrene. For the square holes near the back, I was concerned about getting these to fit flush with the car side, but then it hit me how to do it. I took some masking tape and applied it to the back side of the shell. Then, after cutting the styrene square to fit, I pressed it in and the tape held it in place while I glued it. I had begun to paint with a base coat of blue when some friendly input at Nscale.Net made me realize that more work was needed. I fabricated the battery box by reusing the walkway portion from the U25b, with some sheet styrene to enclose the other sides. I also figured out how to make the bell; I reused the bell that came on the U28c by drilling a small hole at the top of the nose, since it presses in to a hole. For the triangular bracket around it, I just used a section of H-column styrene casting which I cut off at an angle, and then removed the flange from the top half. The bell from the Trix engine is a little bit on the large side, but I think I can live with it. I didn’t take as many photos during the painting process, so all you get is the final roster shot. You can spot the excess length if you compare the rear truck to the front; the front truck is tight to the steps while the rear truck sits in about a scale foot from the steps. But I don’t think it’s that noticeable – it’s less so than I was fearing it would be. Before I unveil the model, though (I know, you just scrolled down, didn’t ya? ), I’ll show you what I am using for the blue color which N&W fans know as “Pevler Blue”. 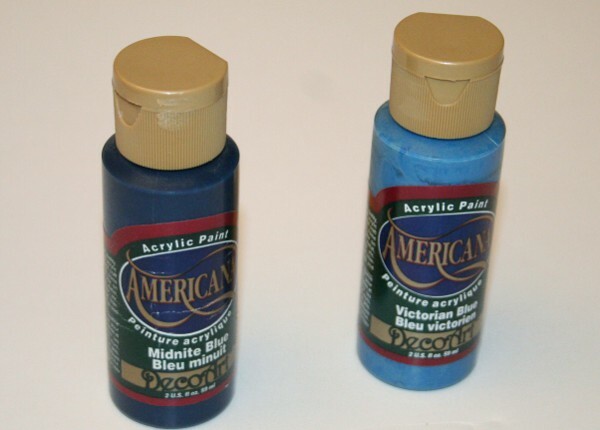 I like to brush paint in thin washes, over a base color that I spray out of a rattle can (I am not a fan of airbrushing). I pick a base color that is as close as possible to the final color, then the washes can control the final hue. For Pevler Blue, I use Midnight Blue, into which I mix a tiny bit of the Victorian Blue to lighten it. To do the silver on the window frames, I used a Sharpie and a steady hand. When done over gloss paint, you can actually scrape off the silver if you goof up. In general, though, as long as you are careful the firm tip of the Sharpie will stay under control.